“Eh, I’m getting old,” causally remarked Robert Pollard, referring to his recent on-stage back injury from his home in Dayton, Ohio. The 44-year-old, former elementary school teacher is the singer, songwriter, and only permanent member of Guided By Voices, one of the greatest bands that most radio-friendly ears have never even heard of. But once exposed to the Guided By Voices empire, many will become borderline worshipers. Magnet magazine publisher Eric T. Miller has said that Pollard has written more great songs than the Beatles, the Who and the Rolling Stones combined. Last year, San Francisco Mayor Willie Brown went as far as declaring April 3, 2001 “Guided By Voices Day” in the city. In an age of utterly disposable bands like Limp Bizkit selling millions of records, this well-merited praise comes to a band that, after 17 years, finally made it to the billboard top 200 last year, peeking at 168. The recently recovered Pollard and company will be kicking off an extensive tour in June in support of their new album, Universal Truths and Cycles [out June 18]. The self-produced, 19-track album is arguably their best since 1995’s Bee Thousand. “I’m really happy with it. It feels like a [GBV] record should,” said Pollard. “It’s like Alien Lanes (1995) meets Isolation Drills (2001).” Universal Truths also marks their return to Matador Records. 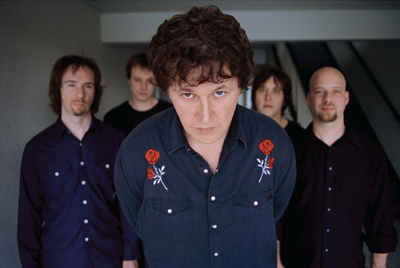 Pollard had previously released three GBV albums and two solo albums on Matador between 95-98. “It is a great label. Being on Matador gives me the liberty to release as many solo and side-project recordings as I want,” related Pollard. On June 17th, they will appear on the The Late Late Show with Craig Kilborn, performing their new single “Everywhere with Helicopter,” a song that Pollard describes as their “summer song, even though it’s not quite about a car, girls or summer.” Following Kilborn, GBV will play a handful of Midwest dates including a June 28th stop in Madison at the Annex and June 30th appearance at Milwaukee’s Summerfest. “We’ve never played at Summerfest, it should be fun. I guess we are playing right before Promise Ring…” Pollard reflects briefly before continuing, “I recently got a call from a promoter in Ohio, who wanted us to open for The Romantics. That was a bit insulting.” People unfamiliar to a typical GBV show can expect two things’ around three solid hours of indie rock and Robert Pollard amazingly out-drinking everyone in attendance. Both are something not to miss.